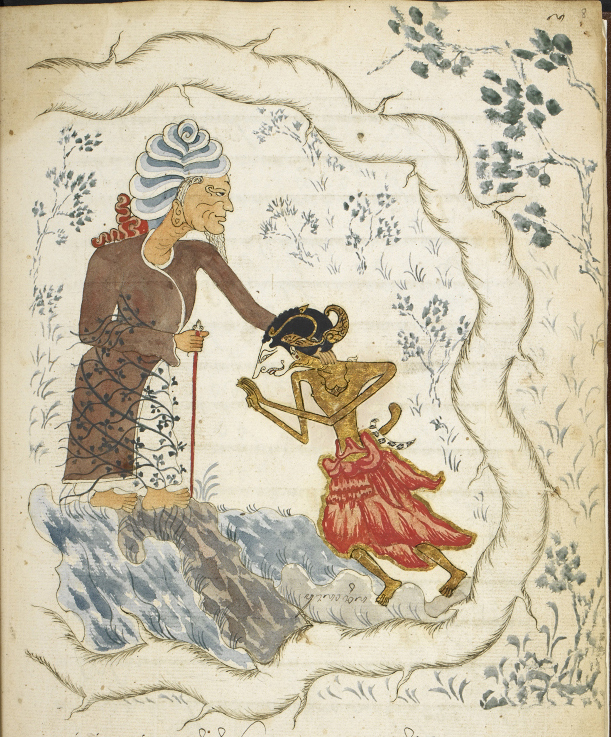 The newly-digitised Serat Damar Wulan (MSS.Jav.89) is one of the loveliest Indonesian manuscripts in the British Library, with a treasury of illustrations depicting Javanese society in the late 18th century. The pictures are rich in humour and the artist had a marvellous eye for facial expressions and bodily postures (a woman sleeping with her arm across her eyes, a sandal just balanced on a foot). Everyday ‘things’ are depicted in fascinating detail, from bird cages to garden pots and textiles, with wonderful scenes of music and dance of enormous interest to performers today, as Matthew Cohen points out in one of his latest posts on his blog Indonesian performances. A contemporary English note which accompanied the donation of the manuscript in 1815 states ‘This Book is said to be 2 hundred years old’ (image numbered ‘front-i’), but according to Dr Russell Jones, the watermarks of the much-thumbed and soiled pages of Dutch paper, ‘J HONIG’ and ‘J H & Z’, have so far only been found in Indonesian manuscripts dated ca.1800 to 1855, and so a late 18th-century dating is perhaps most likely for this manuscript. 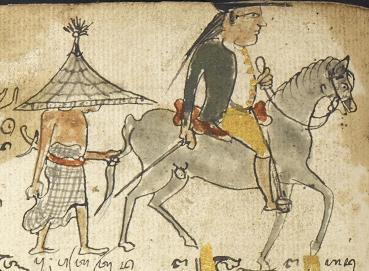 A messenger on horseback bringing news Daha has been attacked by Balambangan (MSS.Jav.89, f.33v, detail). Early scholars of Javanese texts were notoriously oblivious to the artistic aspects of manuscripts, but the Serat Damar Wulan proved irresistible. In 1953, Lina Maria Coster-Wijsman (grandmother of Javanese art historian Marijke Klokke) published a valuable study, ‘Illustrations in a Javanese manuscript’, identifying all the illustrations in the manuscript. For a concordance of her illustration numbers with the current folio numbers of the British Library manuscript (Damar MSS.Jav.89) click here. Pages from the Serat Damar Wulan were also reproduced in colour in the British Library photographic exhibition Golden Letters, which travelled all over Indonesia in 1991, and in the book Early views of Indonesia, which was published in 1995 as a gift from the British government to mark the 50th anniversary of Indonesian independence. One picture showed Damar Wulan being prepared for his marriage by two formidable female attendants, looking exactly like the bossy professional wedding planners still active today. Imagine my surprise when, in 2000, I noticed on the wall of the Jakarta home of my friend Jennifer Lindsay a glass painting of exactly this scene, which she had bought in the market in Solo the previous year. (Knowing how much I loved the picture, in 2003 Jenny generously gave it to me, and it will eventually join the collections of the British Library). It was wonderful to see how, after a period of two centuries, the pictures in the Serat Damar Wulan were feeding back into the artistic life of Java. With the full manuscript now online, hopefully the digitised images will inspire many more such artistic re-creations. 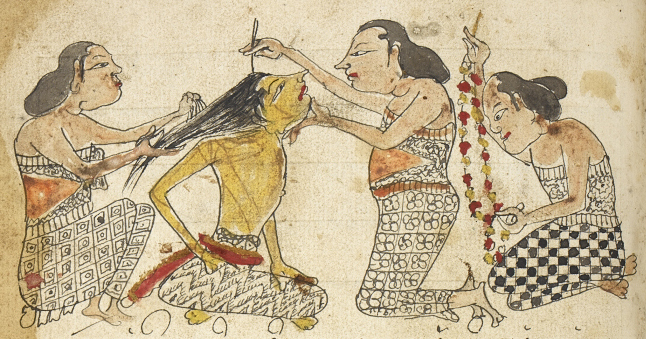 Damar Wulan being prepared for his wedding, 18th c. (MSS.Jav.89, f.134v, detail), published in Early views of Indonesia (1995). 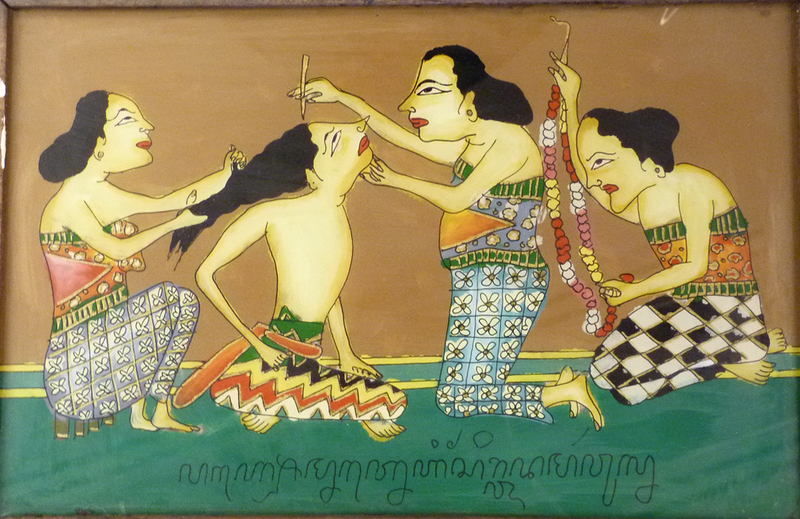 A glass painting of the same scene, produced in central Java, ca.1998. ‘Editorial note‘, Bijdragen tot de Taal-, Land- en Volkenkunde, 1953, 109 (3): 276. Annabel Teh Gallop, Early views of Indonesia: drawings from the British Library. (London: British Library, 1995), p.58. 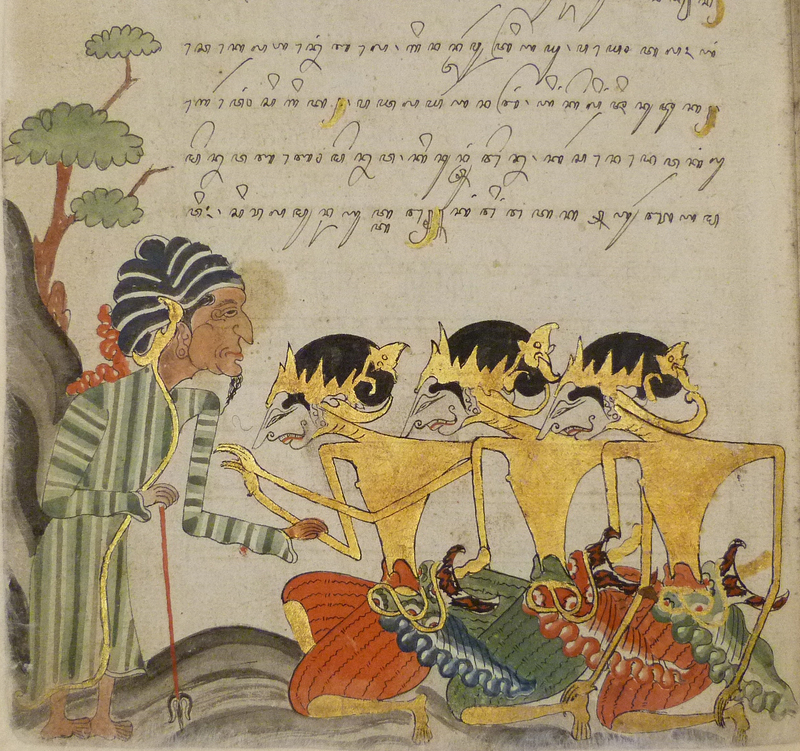 The Serat Selarasa is the most beautiful Javanese manuscript in the British Library, and perhaps the earliest finely-illustrated Javanese manuscript known. The manuscript is dated 1804, and according to a note in the text was once owned by the wife of a Dutch East India Company official in Surabaya. 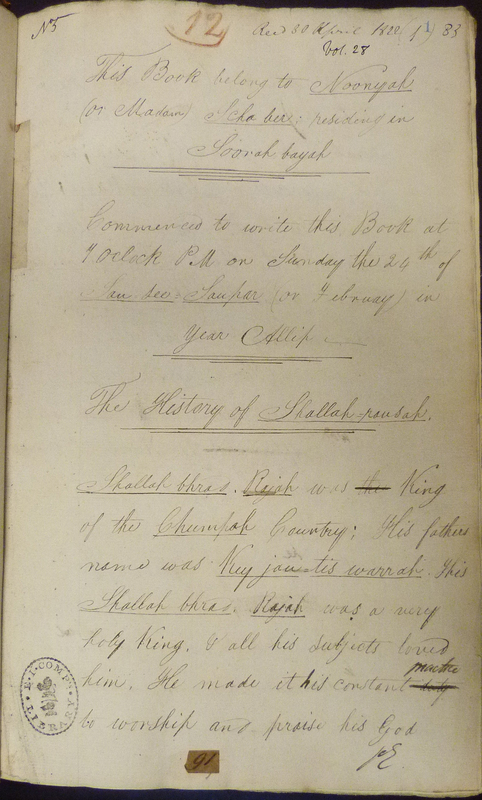 This was probably F.J.Rothenbühler, from whom Col. Colin Mackenzie received this manuscript in 1812. Mackenzie evidently had a special interest in this manuscript, for amongst his private papers is a complete English translation of the Serat Selarasa (Mackenzie 1822, vol.28, pp.1-152). Although the manuscript was illustrated by the same artist throughout, there is a different approach in the first part of the manuscript (up to f.19v), where the pictures are larger and the characters range vertically across the page, some with ethereal pastel background settings, as seen below. Thereafter, the pictures are structured more conventionally along the bottom of the page, essentially on a single horizontal plane. Mackenzie also received another illustrated Javanese manuscript from Rothenbühler, a copy of the Serat Panji Jayakusuma (MSS.Jav.68), and a translation of this text, entitled ‘History of a Raja of Kling’, is found in the same volume of Mackenzie’s papers (Mackenzie 1822, vol.28, pp.153-320). This manuscript is almost but not quite as fine as the Serat Selarasa, with considerable use of silver (now tarnished) as well as gold, and further investigation is needed to determine the artistic relationship between the two manuscripts. Annabel Teh Gallop with Bernard Arps, Golden letters: writing traditions of Indonesia / Surat emas: budaya tulis di Indonesia (London: British Library; Jakarta: Lontar, 1991), pp.88-89.